An artist’s rendition of China’s Mars rover. China plans to launch a probe to Mars in 2020, which is expected to reach the red planet in 2021, said an official of the China National Space Administration (CNSA) at a sub-forum of the World Conference on Science Literacy 2018, held on Sept. 18, Beijing News reported. China is currently planning deep space exploration programs, said Li Guoping, Director General of the Department of System Engineering of China National Space Administration (CNSA) at the sub-forum on Space Exploration and the Future of Mankind. The probe will launch in July 2020, and is expected to land on Mars in 2021. 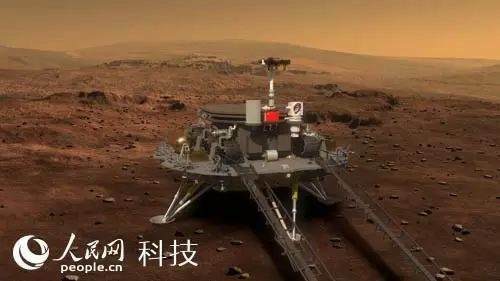 China plans to conduct its second Mars exploration mission in 2028, with the intention of bringing back Martian soil for scientific investigation, Li noted. China will also launch the heavy-lift carrier rocket, Long March-9, in 2028. The rocket will exceed 90 meters in length, with a diameter of 10 meters. Li explained that it will be able to carry a weight of 140 tons into low-Earth orbit, five times that of the Long March-5. The country will also step up its efforts to use space technology to monitor global climate change, said Li, adding that projects using two specific satellites have already been launched, one for monitoring atmospheric environment and the other for terrestrial ecosystems. The Chinese government holds a positive attitude towards commercial rocket companies who have launched small, self-developed rockets recently, Li disclosed, saying that the government is working on details to reinforce management of their launches and activities.